Modern, Brighter than Silver, no tarnish. 14K white gold is a popular metal for its more modern and neutral color aesthetic. I can't think of a stone that doesn't look good in 14K White gold. 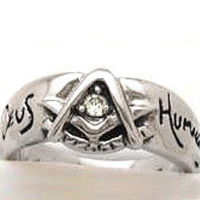 The metal is so clean, pure, crisp, almost chrome-like in its purity, that the stone itself seems to set the tone of the ring. 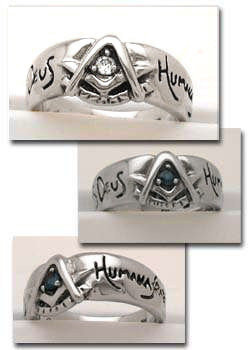 Put in a sapphire, and it's a classic blue lodge ring, put in a diamond or aquamarine for an "icy" Past Master's ring, while an alexandrite creates an interpretative work of art. 14K White Gold. Looks good with anything.